The $3,000 awards allowed the two students to spend their summer researching issues impacting the coastal ecosystem. The seniors will present their experiences at the third annual Climate Science and Policy conference later this month. The summer research Pineda conducted in ocean sciences professor Christina Ravelo’s lab laid the foundation for her senior thesis–which examines the denitrification process of the ocean floor. Pineda, a transfer student from Pasadena City College, began working with Ravelo two years ago as a work study student. She remembers when a six-foot-long tube of ocean sediment arrived at the lab. “I was there when the core first arrived,” Pineda said. She helped examine each layer and is still in awe of how something so small in scale leads to results with big impact. Ferrer is similarly struck by the how intense, varied, and even unpredictable the research process is. Ferrer spent the summer working with Kristy Kroeker, assistant professor of ecology and evolutionary biology, to explore the impact of seawater pH. She helped recreate complex ecosystems in the lab, “which was hard to pull off,” she said. Ferrer remembers one night when the C02 machines in the lab went down, or when she had to find a fish that was out of season. “It was action packed summer,” she said. These types of hands-on learning experiences exemplify the goals of Keeley Coastal Scholar program: to give students the first-hand perspective of working in scientific research. Pineda received the award for her paper "Climate Impacts on Upwelling, Biological Productivity, and Rainfall in Coastal Central Mexico Over the Last 2000 Years" and Ferrar for her research on "The Effects of Ocean Acidification on Predator-Prey Interaction in Seagrass Systems." 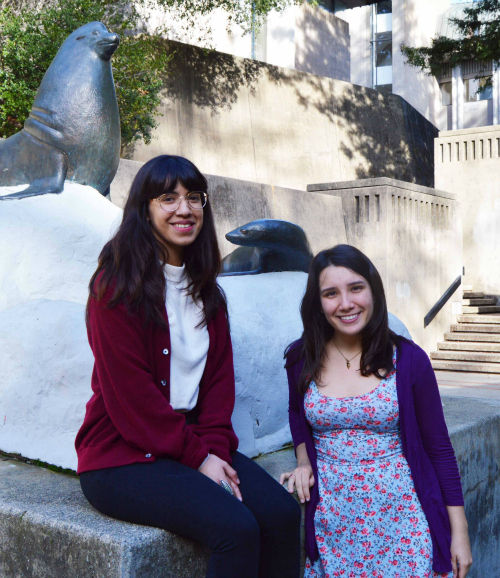 The Keeley Coastal Scholars Program provides students from underrepresented groups in California the financial support to engage in summer research and policy work connected to coastal sustainability. Many students find it they must work during the summer to finance their education. This causes an interruption of their academic studies and often precludes them from participating in intensive, faculty-led research proj­ects. The Keeley scholarship helps make an uninterrupted focus possible – ultimately improving the academic experi­ence while furthering research that addresses coastal sustainability. The award is named in recognition of Fred Keeley’s significant contributions to protect California’s natural environment and inspirational track record in environmental policy. Keeley, who recently retired as Santa Cruz County Treasuer/Tax Collector, represented the Monterey Bay area in the California State Assembly from 1996 through 2002, and earlier served as a Santa Cruz County supervisor. During his tenure in the state legislature he authored the Marine Life Management Act, which the Associated Press called the "most significant advancement in ocean policy in 50 years." Keeley also authored the two largest park and environ­mental protection bonds in the state (and nation)'s history. He is a board member of the California Ocean Science Trust and the National Marine Sanctuary Foundation. In addition, in 2003 the campus established the Keeley Lecture on Environmental Policy. This year former secretary of energy and Nobel prize winner Steven Chu will deliver the lecture Feb. 27 at the Climate Science and Policy Conference.